The tone-on-tone of this is really gorgeous. (Click on the image to go to the blog and see a full-length view.) I would love to see something like this on a non-princessy wedding dress, say a simple silk sheath in cream with cream roses along the waist and hem in taffeta or even organza. While I'm at Colette's blog, I would like to point out how cute these little bias-tape bows are. Adorable! And speaking of embellishments, I *think* I saw recently a dress with a heart on it, where the heart was made of random sizes of heart-shaped buttons. Does that sound familiar to anyone? Or did I just make it up? Thanks to Kathleen for the link! Oh my goodness, thank you for the link to Collette Patterns! Boy, thats pretty! And I love the Collette blog. If I hadnt sworn off buying patterns for 2010 I think I would have ALL of them. 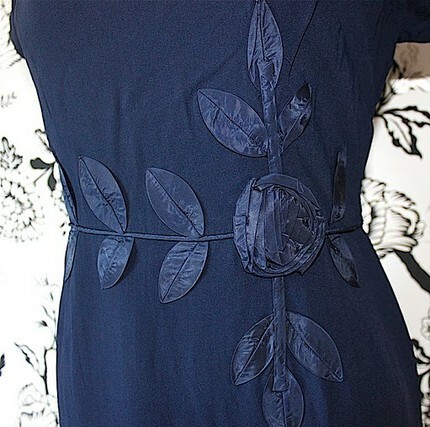 I will definitely have to try the bias-tape-bows trick on a 1940s blouse pattern I have waiting to be made up! This is gorgeous. Your idea of using this on a wedding dress it wonderful. Thanks!!! Collette Patterns–what a neat place to visit, thanks! Yeah…really neat! Would look cool as a white crepe dress with orange satin applique, too.Good way to cover the waist seam, and create a seemingly more unbroken line to the garment. Patrick Kelly used to do a variety of jersey dresses with a heart shape on the front made of buttons. That was a little while ago, in the dreaded 80s. Gorgeous! And someone snatched it up already. I loved the bias tape bows, too. Very sweet! Beautiful patterns! Thanks for sharing! Simpy fab! I love those vintage details that seem to be missing from todays styles.